Watch Play on PBS. See more from ART:21. Esteban Delgado, whose work was displayed at Avis Frank Gallery earlier this month, couldn’t be further away from Jessica Stockholder in his practice. 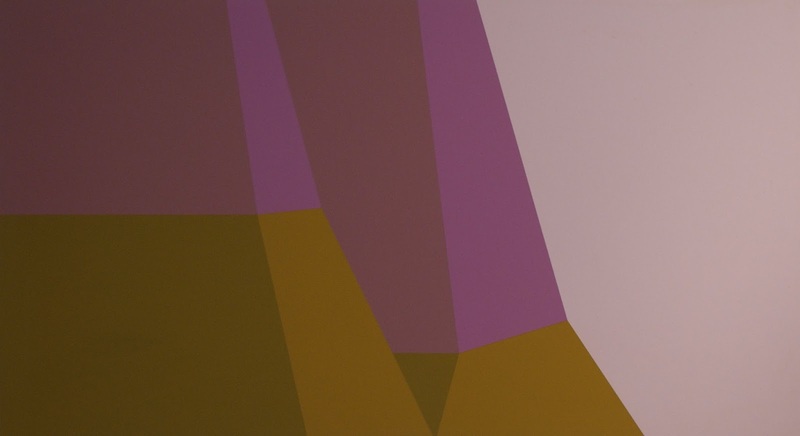 He is an abstract painter: geometric abstraction to be exact. The closest he gets to installation is painting on walls. Everything is flat: as he states flatly (pun intended) in his artist statement, “the work is obsessively flat.” And while all of his work emphatically feels that way, there’s something in the architecture of his paintings that is thick, that shares an affinity with Stockholder’s gravitation towards plastic. Likely due to his choice of materials, which consist almost entirely of acrylic latex or enamel on panel, everything reads as industrialized. Idioms of Change (2012) jockeys between positive and negative space, representations of landscape and rabid machination. Bold colors clamor for attention like clawing advertisements. Upon closer examination the viewer can see the lines Delgado probably taped off while painting, allowing her to engage with the paint as material instead of simply as color and line. One would presume that evidence of brushstrokes would betray the mechanized gravitas, but here they remarkably make everything look even less human. 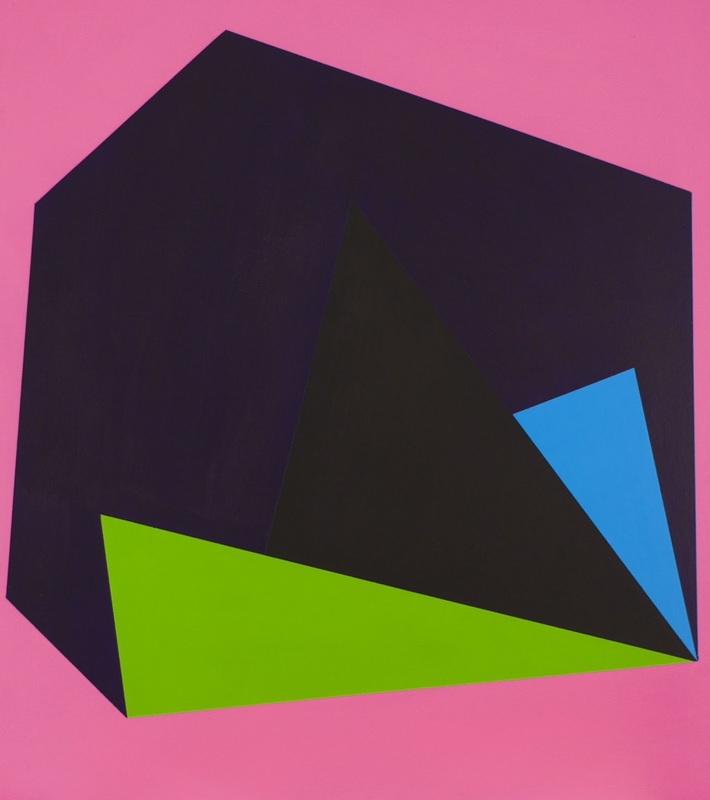 Delgado states that his work is influenced by regional colors and landscapes, and that is readily apparent in most of the work, particularly Cuates Feo (2013). Cuates Feo presents what appears to be two cropped, closely snuggling mountains in the left two-thirds of the panel. The left mountaintop stands resolute as the right one leans in, seeking comfort as they both fade to purple with the sunset. But while he effectively extracts pathos from the viewer with these mountainous characters, the general premise of linking abstraction to regional landscape seems obvious and unchallenging. Primetime (2013), on the other hand, asks more from the viewer. The innocuous scale at about a foot and half by two feet belies the dramatic landscape suggested in the abstraction. This time, however, the landscape is contained within a box that reads as a television set, further implied by the title. The juxtaposition in color between the bright and faded reds in the landscape indicates expanse, ratcheting up the tension of vastness and containment. Questions of nostalgia, notions of interior and exterior spaces, and even subtle interrogations of what constitutes a landscape appear to crop up in this piece more so than any other work in the exhibition. While reading more assertively and exclusively as a landform, Tectonic (2013) also effectively engages in this shift of interior and exterior space. 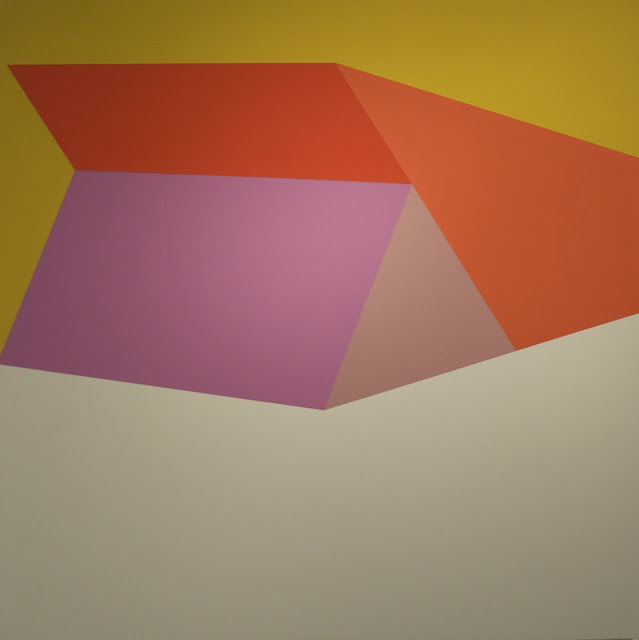 The link between title and form are easy to connect: the painting looks like a pared down, geometric model of one tectonic plate sliding over another. In that it feels like a representation of a model as opposed to the real thing is likely due to the objects’ lack of cropping—well, almost lack of cropping. The red plate is mostly contained within the frame with the exception of its tail on the right, and the very bottom left tip of the purple plate is cropped out. But because most of said plates are captured within the painting’s boundaries, they simultaneously read as something smaller, like children’s playing blocks, or maybe severely uncomfortable modern furniture. The shadows cast on the dark side of the plates seem improbable in sunlight, as if a lamp is illuminating them instead. In this and Primetime, Delgado appears to be conflating the drama, romanticism, and potential violence of nature with the banality of our interior lives. 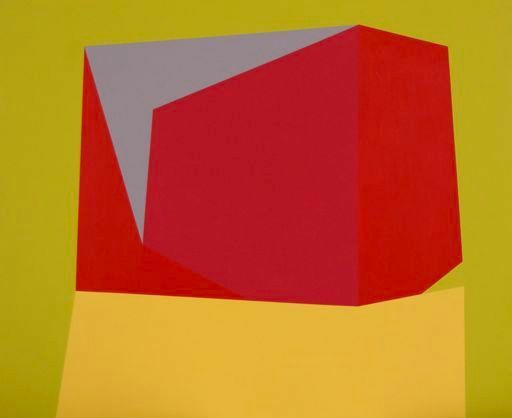 Esteban Delgado constructs geometric abstractions in such a way that enhance the viewers’ experience beyond the sensibility of color and form. Ironically, it is his method of painting and choices of color that allow the viewer to additionally engage with the materiality of the paint in a way that’s nearly sculptural. While some of the work may be too easily graspable in its allusion to regional landscape, others are making compelling demands of the viewer—demands that Delgado may not have even intended. Or if he did, he certainly did not let on in his artist statement. All of this makes one wonder: why was this work on display so briefly? 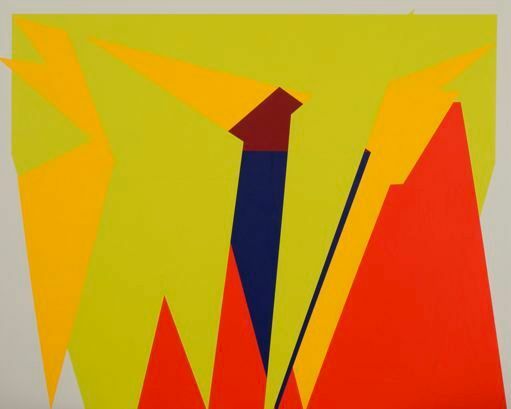 Abstractive Constructions ran from August 2-15, 2013 at Avis Frank Gallery.